Every tragedy has a tale. This tale of greed is told through the eyes of outsiders who bet against Wall Street's greed, and won. Ironically, so did Wall Street. There lies the tragedy. Told by retracing the path taken by a few contrarian outsiders - Steve Eisman, Michael Burry, Greg Lipmann, Howie Hubler, and others - who saw the house of cards for what it was: built by a grotesque mix of greedy and sometimes outright stupid Wall Street bankers, and stamped with the authority of incompetent, "brain-dead" employees of the ratings agencies - S&P, Moody's, and Fitch. Steve Eisman is a second-generation Wall Street fellow (his parents worked on Wall Street), who is marked by an almost complete lack of social grace (he does try and develop some inter-personal skills after the collapse of Wall Street though). It doesn't end here. Steve Eisman was plain blunt when it came to voicing his opinions. There doesn't seem to be a shade of gray here - things for him were either black or white, never anything in-between. A prominent theme of Barry Ritholtz's book, Bailout Nation (my review post, my Amazon.com review), was that the ratings agencies were, if not outright hand-in-glove with the investment firms in the ratings fraud that enabled the subprime mortgage bonds catastrophe, at best outright incompetent, who were clueless on how to rate these CDOs, and relied on the investment firms' models. Sort of letting the thief select the combination to a vault. 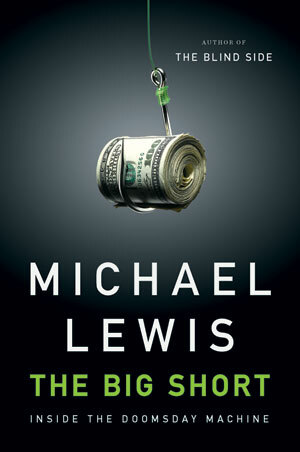 Michael Lewis comes to the same conclusion, pretty much, but it is much more devastating an indictment when delivered through the words of an insider - yes an insider. But everyone on Wall Street knew that the people who ran the models were ripe for exploitation. "Guys who can't get a job on Wall Street get a job at Moody's," as one Goldman Sachs trader-turned-hedge fund manager put it. Inside the rating agency there was another hierarchy, even less flattering to the subprime mortgage bond raters. "At the ratings agencies the corporate credit people are the least bad," says a quant who engineered mortgage bonds for Morgan Stanley. "Next are the prime mortgage people." Then you have the asset-backed people, who are basically brain-dead." So you have greed, a willing accomplice in the ratings agencies. Now you need to cover your theft in a cloak of incomprehensibility. I.e., to be able to pull off a fraud, you first have to not call it a fraud. In the world of finance, in the esoteric world of asset-backed securities, you began the process of dissemination by calling them anything but junk. Michael Burry was perhaps the first to buy a credit default swap on these sub-prime mortgage bonds. He had what people called an anti-social personality. It was only later, much later, that he learned that he had Asperger's Syndrome, and that too because his wife took their son to a doctor, who diagnosed their son with Asperger's. Investment firms like Goldman Sachs invest hundreds of millions of dollars in technology to build cutting edge trading platforms that can give them a fraction of a second advantage in executing trades, millions of trades a day. Funny then that when the sub-prime excreta hit the fan, these firms should come up with the excuses they did. On June 14 (2007), the pair of subprime mortgage bond hedge funds effectively owned by Bear Sterns went belly-up. In the ensuing two weeks, the publicly traded index of triple-B-rated subprime mortgage bonds fell by nearly 20 percent. ... On Friday, June 15, Burry's Goldman Sachs saleswoman, Veronica Grinstein, vanished. He called and e-mailed her, but she didn't respond until late the following Monday - to tell him that she was "out for the day." On June 20, Grinstein finally returned to tell him that Goldman Sachs had experienced "systems failure." That was funny, Burry replied, because Morgan Stanley had said more or less the same thing. And his salesman at Bank of America claimed they'd had a "power outage." It was precisely the moment he had told his investors, back in the summer of 2005, that they only needed to wait for. Crappy mortgages worth three-quarters of a trillion dollars were resetting, from their teaser rates to new, higher rates. Greenspan he viewed as almost beneath his contempt, which was saying something. "I think Alan Greenspan will go down as the worst chairman of the Federal Reserve in history," he'd say, when given the slightest chance. There was now hardly an important figure on Wall Street whom Eisman had not insulted, or tried to. ... Esisman had invited the bullish-on-subprime Bear Sterns analyst Gyan Sinha to his office and grilled him so mercilessly that a Bear Sterns salesman had called afterward and complained. "Gyan is upset," he said. In ending, while one can argue that investing is a form of gambling, what separates this crisis from others is that not a single gambler left the table losing. The only losers were the government. Or to put it more accurately, the taxpayer. This is an excellent read. The only shortcoming is that somehow the narratives of the characters - do not seem to tie together very well. They run in parallel, but are never coalesced together. This minor quibble aside, the book is an enjoyable read.